The Dorothy Chandler Pavilion is located on the south end of the Music Center Plaza. The Plaza is bordered by Grand Avenue on the East and Hope Street on the West. The Music Center is located in Downtown Los Angeles at the corner of Grand and First. Our address is 135 N. Grand Ave., Los Angeles, CA 90012. Google Maps Due to the start of construction of the new Civic Park across the street, access points into and out of the Music Center garage are limited. Please allow extra time for parking and plan to arrive one hour prior to start time. ENTRY Grand Avenue entry into the garage will be available via SOUTHBOUND traffic only. There will be NO northbound access (or left turn) into the garage. EXIT Patrons parked on UPPER LEVELS will be directed to exit onto southbound GRAND AVENUE, right turn only. Patrons parked on LOWER LEVELS will be directed to exit onto southbound HILL STREET, right turn only. FREEWAY ACCESS The 110 Freeway on-ramp located at 5th Street provides access to all major freeways (110, 10, 101, and 5) out of Downtown Los Angeles. Based on the flow of traffic, it is recommended that patrons use the freeway on-ramp at 5th Street. Southbound Grand Avenue and Hill Street lead to 5th Street, which runs westbound only. 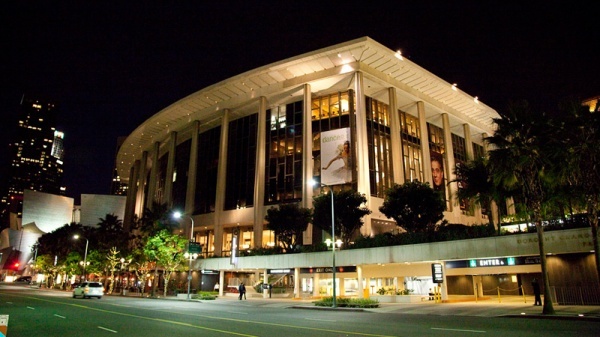 The Dorothy Chandler Pavilion is located on the south end of the Music Center Plaza. The Plaza is bordered by Grand Avenue on the East and Hope Street on the West.The Music Center is located in Downtown Los Angeles at the corner of Grand and First. Our address is 135 N. Grand Ave., Los Angeles, CA 90012. Google MapsDue to the start of construction of the new Civic Park across the street, access points into and out of the Music Center garage are limited. Please allow extra time for parking and plan to arrive one hour prior to start time. Grand Avenue entry into the garage will be available via SOUTHBOUND traffic only. There will be NO northbound access (or left turn) into the garage. Patrons parked on UPPER LEVELS will be directed to exit onto southbound GRAND AVENUE, right turn only. Patrons parked on LOWER LEVELS will be directed to exit onto southbound HILL STREET, right turn only. The 110 Freeway on-ramp located at 5th Street provides access to all major freeways (110, 10, 101, and 5) out of Downtown Los Angeles. Based on the flow of traffic, it is recommended that patrons use the freeway on-ramp at 5th Street. Southbound Grand Avenue and Hill Street lead to 5th Street, which runs westbound only. Self Parking -- $9 Ample parking is available for $9 in the Music Center Garage beginning at 4:30pm for evening performances, beginning at 5:00pm for evening performances at the Walt Disney Concert Hall Garage; two hours before weekday matinees; and all day on weekends. Higher rates apply before those times. Accessible parking spaces for vehicles displaying valid, state-issued disability parking placards or license plates are reserved near the elevators on each level. Valet Parking -- $23 Valet parking at the Music Center is available at two locations: Hope Street circular drive between First and Temple Streets, adjacent to the Music Center Plaza. Valet parking at this location is available beginning two hours prior to performances and best serves engagements at the Ahmanson Theatre, Mark Taper Forum and the Dorothy Chandler Pavilion. Valet for vehicles displaying valid, state-issued disability parking placards or license plates is $9. Hope Street between First and Second Streets, at the Founders Circle Parking Garage, adjacent to the Walt Disney Concert Hall. This entrance is accessible via northbound traffic only. Valet parking at this location is available beginning two hours prior to performances and best serves engagements at the Walt Disney Concert Hall. Valet for vehicles displaying valid, state-issued disability parking placards or license plates is $23. Box Office Parking To make ticket purchase and pick-up easier, the Box Office provides validation for 30 minutes free parking in the Music Center Garage. An $8 cash deposit is payable upon entering the garage. Please obtain a validation stamp from the ticket seller. Regular daily parking rates ($3.50 for every 15 minutes; $20 maximum) will apply after 30 minutes. Ample parking is available for $9 in the Music Center Garage beginning at 4:30pm for evening performances, beginning at 5:00pm for evening performances at the Walt Disney Concert Hall Garage; two hours before weekday matinees; and all day on weekends. Higher rates apply before those times. Accessible parking spaces for vehicles displaying valid, state-issued disability parking placards or license plates are reserved near the elevators on each level. Hope Street circular drive between First and Temple Streets, adjacent to the Music Center Plaza. Valet parking at this location is available beginning two hours prior to performances and best serves engagements at the Ahmanson Theatre, Mark Taper Forum and the Dorothy Chandler Pavilion. Valet for vehicles displaying valid, state-issued disability parking placards or license plates is $9. Hope Street between First and Second Streets, at the Founders Circle Parking Garage, adjacent to the Walt Disney Concert Hall. This entrance is accessible via northbound traffic only. Valet parking at this location is available beginning two hours prior to performances and best serves engagements at the Walt Disney Concert Hall. Valet for vehicles displaying valid, state-issued disability parking placards or license plates is $23. To make ticket purchase and pick-up easier, the Box Office provides validation for 30 minutes free parking in the Music Center Garage. An $8 cash deposit is payable upon entering the garage. Please obtain a validation stamp from the ticket seller. Regular daily parking rates ($3.50 for every 15 minutes; $20 maximum) will apply after 30 minutes.